Wood is a material which by nature expands, shrinks and bends. Focusing on the use of veneers, there are several fabrication methods used by different industries that make use of wood’s hygroscopic and anisotropic properties in order to manufacture curved elements. Each method has limitations and application restrictions. Lamination is currently the most common method for fabricating single and doubly curved geometries out of timber. Whilst insitu bending and steam bending apply post curvature to pieces or flat sheets of cross laminated veneer such as plywood, the direct lamination of veneers around a mould, allows for a much greater control of material and geometrical form. 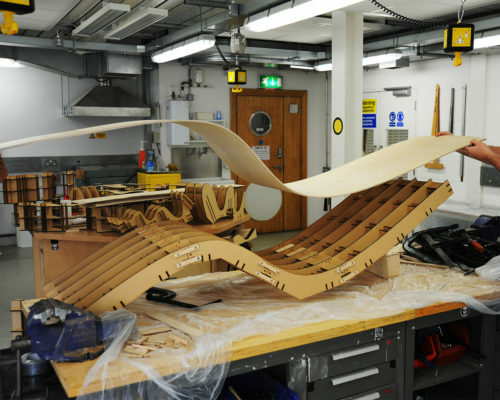 To bridge the gap between these two methods new composite plywood sheets are being developed to achieve tighter and more complex curvatures without the need for applying wet glue. 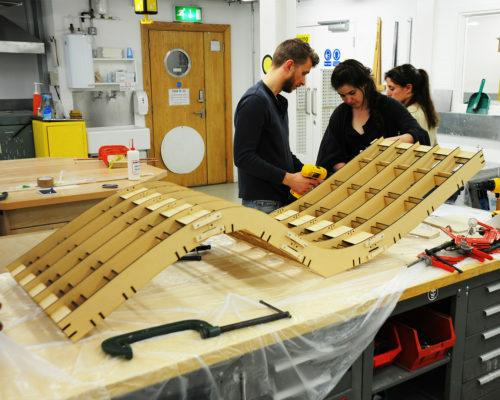 Laminated Chair is an outcome of research on wood fabrication techniques in order to propose a seating system for a Pop-Up Cinema project in Gillett Square, Dalston, London. 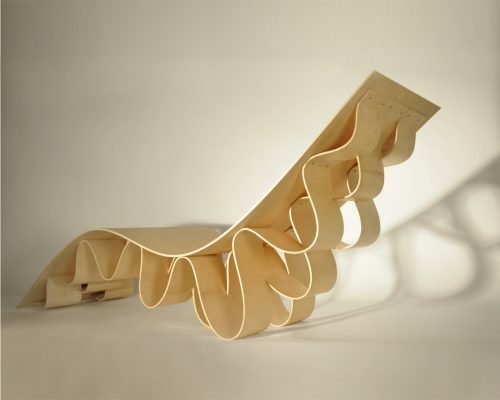 A chaise longue wave design concept was developed to provide the user with a comfortable and embracing form on which to sit and enjoy the film. Whilst the curve of the top piece undulates to hold the user, an interlocked system of three waves distributes the users load to the ground. 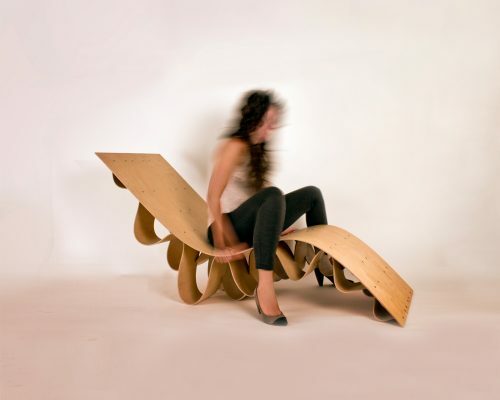 The chair utilised 3mm thick layers of plywood which were laminated together in different numbers of layers for the three wave components and bracing seat deck. Individually each component of the system was flexible, but once the pieces were connected together, the components interlocked as one system, providing the assembly with enough strength and stiffness to assume the weight of the user. Grain orientation of the wood played a crucial part in the fabrication process. Bending strips of plywood parallel to the grain direction allowed for tighter curvatures to be achieved, but reduced the stiffness of each piece. Whilst the magnitude of the curvatures in the three wave strips was too tight to introduce alternating plywood pieces with perpendicular grain direction, the deck combined a cross lamination assembly to increase the stiffness of the plate.